Hungarian MPs face a key vote later on whether to tighten border controls as migrants try to pass through to their preferred destination, Germany. Three other European meetings on Friday will discuss the migrant crisis. Members of the European Commission are also flying to the Greek island of Kos to examine the difficulties caused by the large numbers of refugees and migrants landing there. The UN has meanwhile urged the EU to admit up to 200,000 refugees as part of "a mass relocation programme" that had the "mandatory participation" of all member states. A statement from Antonio Guterres, the UN High Commissioner of Refugees, said Europe needed to build "adequate reception capacities", especially in Greece, replacing a "piecemeal" approach with a "common strategy". The Hungarian MPs will also vote on creating new holding camps for migrants, and on whether the situation constitutes a state of emergency. Media captionHungary's prime minister says the migrant crisis is "a not a European problem, it is a German problem"
However, Luxembourg's Foreign Minister Jean Asselborn - who is heading the EU meetings on the crisis - criticised Hungary's conservative leader on German television on Thursday night, saying: "One sometimes has to be ashamed for Viktor Orban." European Council President Donald Tusk said at least 100,000 refugees should be distributed across EU states - a sharp increase on a previous European Commission target of 40,000. German Chancellor Angela Merkel and French President Francois Hollande said they would present plans for the redistribution of refugees within the EU. The British government, in particular, is coming under growing pressure to take in more migrants. British Prime Minister David Cameron is expected to announce plans to allow more Syrian refugees into the country, to help ease a crisis brought to the fore this week by images of a three-year-old Syrian boy found drowned in Turkey. Mr Cameron is heading to Spain and Portugal for talks on Friday that are sure to include the migrant crisis. Last week, the German government indicated it would grant asylum to Syrian refugees regardless of how they'd entered Europe. That attitude has enraged the Hungarian leader, Viktor Orban, who blames Germany's welcoming reputation for the high number of refugees crossing his country. Angela Merkel disagrees. 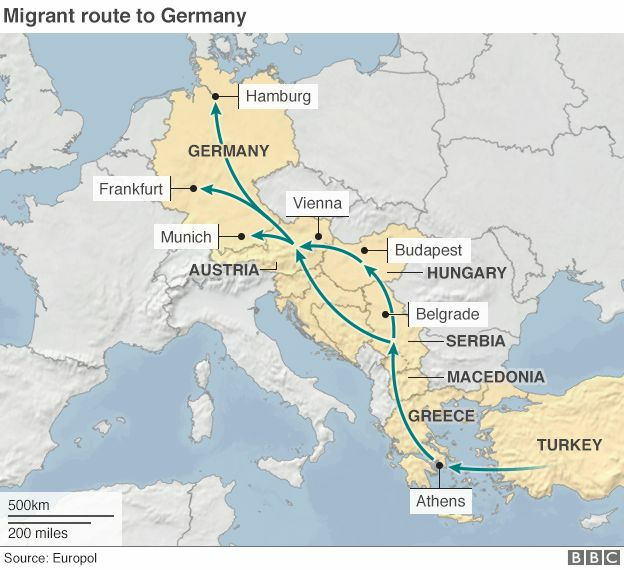 Germany, she said, is simply fulfilling its "moral and legal" obligations. This is a situation which, she argues, "affects all of us in Europe". But it's a situation that creates a huge domestic challenge too. Up to 800,000 people are expected to seek asylum in Germany this year alone. Instead, the train stopped at the Hungarian town of Bicske about 40km (25 miles) west of Budapest, which hosts a major refugee camp. Police then lined the platforms.